Monday was all about saving money so today is about making money- I find this a lot more fun then saving and I tend to get more out of it. There are the ore obvious ways of making money such as cleaning and babysitting which can be effective and easy ways of making money but there are some more creative ways of making money that I'm going to share with you. 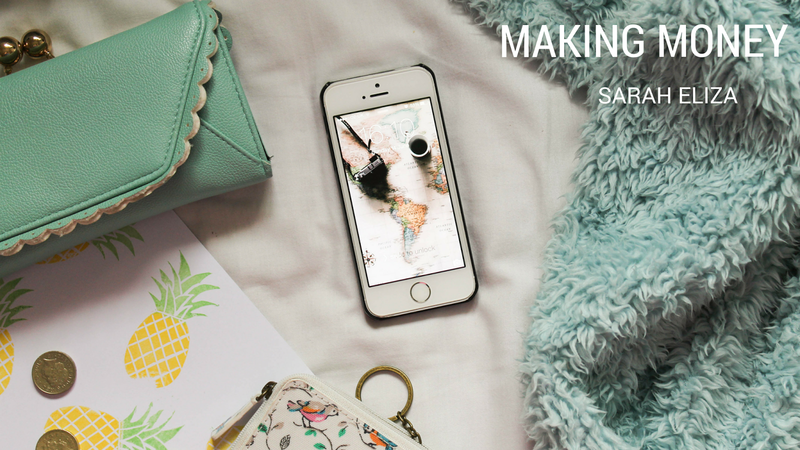 Have a blog sale: Your blog can be a great place to sell your stuff as you're selling to an audience that you know will be interest in the things you're selling whether it be barely used make up, clothes or books. If you include it regularly on your blogs, your readers will likely to be on the hunt for certain items at a discount which you will you be giving to a new home and making a little money from. Ebay/Depop: These platforms are other ways to sell your things and are a little more structured. While I've bought from both Depop and Ebay, I have no experience working on the otherside by selling but over the summer I'm going to definitely be adding somethings to ebay that I no longer want and think others may be interested in. There's no point something sitting there collecting dust if someone else could use it and you could make some money. If, like me, you're a keen photographer, it can be a great way to make your own money straight from your phone. There are a few different apps where you can sign up and upload photos and take part in competitions. If you win, you can receive sums of money around £100. The one I use and favor is Foap. It's a really easy app to use and work your way around. The probability of you winning is probably fairly unlikely due to the number of entrants but I think it's a fun thing to do and, seeing as I'm taking photos anyway, I don't see the harm of at least trying to make some money out of it! Music Magpie: If you have all your old Pop Party and Now 59 CDs lying round no being listened to anymore, Music magpie is a great way to get rid of them and recieve a small amount of money in return. While you don't receive as much money as if you were to sell it on a site like Ebay, you are guaranteed a sell and some money so if you want to just get rid of old CDs, DVDs and PC games this is a quick fix. Opinon Outpost: This is no way a real money making website. You get a small sum of money for every questionaire you answer. It really is pennies that you earn but if you're really desperate or just bored one day and don't mind doing some online questionnaires, I'd suggest signing up. Quidco: This is a recent find and it's really good! It's a website where you receive money back for buying off a site through Quidco. The company receive money for the click-through purchases they get and they give some of that money back to you. Really, you're saving money then making it but you receive after you've put in your order and get a certain percentage of cash back. There's some big websites on there such a Amazon, Boots, ASOS and many more. This takes a lot more planning, motivation and time but I think, if everything is done well, can be the most effective way of making money. If you have a certain talent whether it's photography, painting, making paper crafts, there is a basis for your small business. I'm planning on doing some posts going into more detail into setting up small businesses as a teen as I have some experience myself so I'll keep this brief but all you need to set up a business is a money making talent, a place to sell it and somewhere for the takings to go. The best sites are Ebay or, Big Cartel and Etsy; it really depends on what you're selling. I've had experience with Big Cartel and I found it great especially in establishing a brand where as, with my new business venture, I will be using Etsy as you can reach a wider audience and there are sections just right for homemade crafts and products. This is actually a great and productive way to spend your summer and the process of setting up a business, while can be stressful, can be very fun and a great way of making money. There is just a few ways of making some money as a teenager and I hope they make come in handy for any of you who are wanting to make a little extra over summer and the coming months. Have you got any other ways of making money? Is there any other good websites or apps?